The email notifications feature allows you to automatically dispatch an email to an entrant the second they enter your campaign. This email can come from your own email address and company name, and the content of the email can say anything you would like. 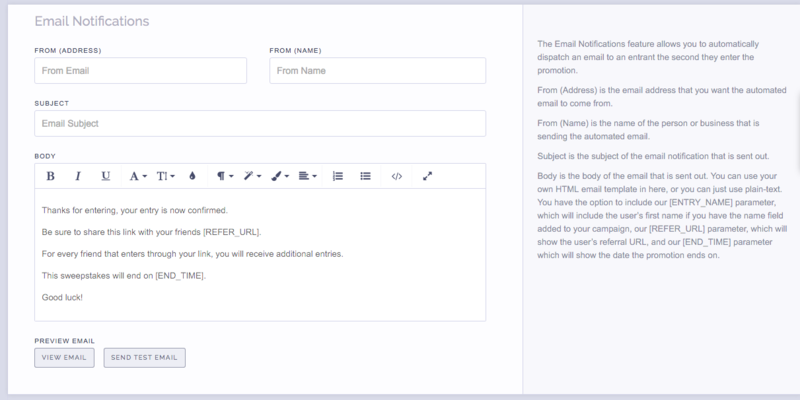 In addition, you even have the ability to drop in your own email template. Thanking someone for entering and providing them with information about your company. Thanking someone for entering and encouraging them to share with friends. Offering a discount or coupon code as a thank you for entering. Offering a free e-book, white paper, or other download as a thank you for entering. When setting up your campaign, navigate to the Email Notifications section. This is the email address that the email will be sent from. Input your company email address here. This is the name of the person or company that the email will be sent from. This will add the users first name if you have the name field added to your campaign. This will display the email address of the person who entered the campaign. This will display the end time of the campaign. This will display the URL of the users contest submission. This will automatically recognize the user has already entered and will show them the post-entry page. The use case for this is if you want them to be able to see the post-entry page from any device (for example, if they enter on desktop then go to your campaign on mobile they will have to enter again). Another use case for this is if you are using Facebook Lead Ads, the user can submit the lead ad, then when they get this email notification, they can click the link we provide with this parameter and it will show them the post-entry page instead of the entry form. Click here to learn more about this feature. The test email feature is purely to see what the email will look like. We do not fill in the parameters in the test email, so you will not see a referral URL, or the end time, etc. If you want to do a live test of this where all the parameters are filled in, save your campaign and enter it to run a live test. Still having trouble with email notifications? Simply click the support or live chat icon to get in touch with us.